A very easy tutorial that uses only two components. 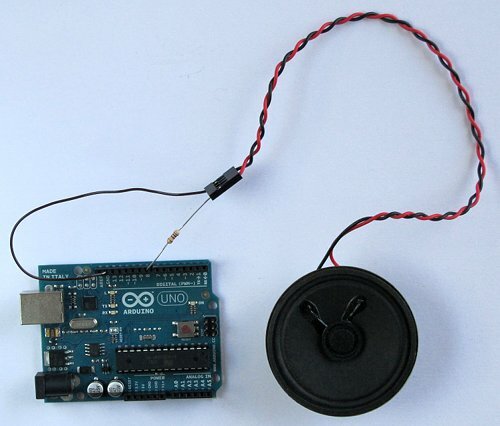 The Arduino plays a short melody on a loudspeaker. The program to load to the Arduino is one of the programs that is built into the Arduino IDE. Complete tutorial 3 - Starting with Arduino and its prerequisites before attempting this tutorial. The circuit diagram shows that the positive terminal of the speaker is connected through a 100 ohm resistor to pin 8 of the Arduino. 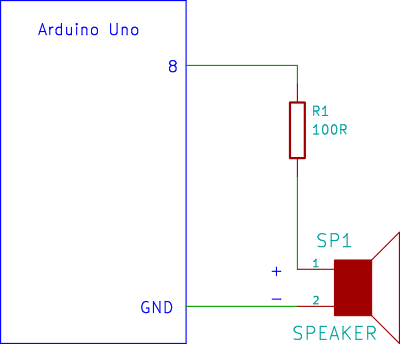 The negative terminal of the speaker is connected to one of the Arduino GND pins. 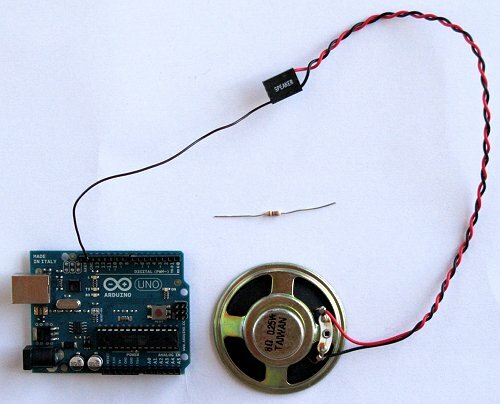 Start by connecting the negative speaker terminal (black wire) to a GND pin on the Arduino. 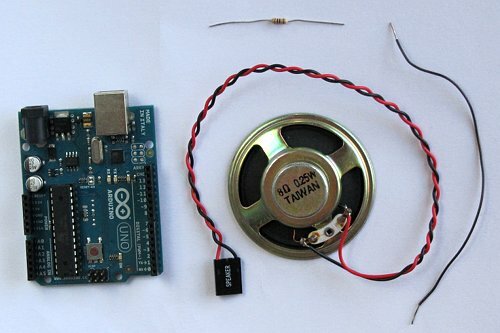 Note that it is not necessary to use a breadboard when using a speaker that is taken from an old PC as it has a connector that a single core wire can be plugged into. Connect a 100 ohm resistor to pin 8 of the Arduino and to the positive terminal of the speaker (red wire). File → Examples → 2.Digital → toneMelody. Load the program to the Arduino and the melody will play immediately after loading. To play the melody again, press the reset button on the Arduino. This project can be found on the Arduino website.